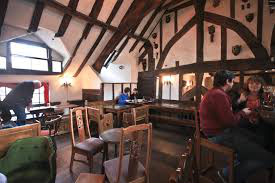 Ivy and I visited a pub in the ancient city of York, an old oak-beamed mead house Its modern name is ‘The House of Trembling Madness’. How could one dine anywhere else? The beer on tap, La Trappiste, is 7.5 ABV, enough to fell an ox. The shop below sells over 600 varieties of beer and 800 lines of spirits. The names were interesting and creative. The walls of the pub were sullied with stuffed animal heads, including a poor tiny mole. As I drank my 5th Trappiste these started to circle around me menacingly.